There’s a problem with back to back vacations; you cannot process one fully before you are exhausted by the next one. Poor me. Sept. 21st saw us rising early and bolting breakfast with a full day ahead of us. We waited for the proper bus and were distressed when it charged past us! Turns out that we did not know the proper hand salute, but watching the natives for awhile, we learned the hand dance and only lost 30 minutes of precious time. I refuse, however, to work out the monetary cost of this. 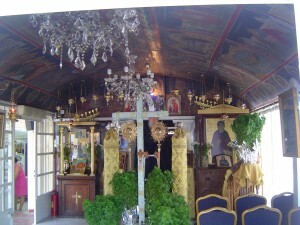 "The Sacred Way", which we followed for much of the bus route. 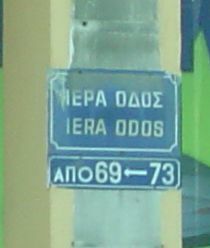 It is basically the only road between Athens and Eleusis [Elefsis]. In Classical Greece, the small village of Eleusis was a pilgrimage shine visited in the Spring and especially the Autumn for the worship of the grain goddess Demeter [accent on De]. Remember the tale of how Hades, lord of the Underworld snatched Persephone, young daughter of Demeter. Demeter caused the world to cease its growing season while she mourned. Zeus granted a compromise whereby Persephone could live above ground for 6 months of the year. [Some same 9 months]. This is the myth that explains the seasons and led to the Mysteries celebrated at Eleusis [now called Elefsis.] Anyone could be an initiate to the rites, be they not a murderer or ignorant of Greek. A promise of secrecy was required and, therefore, no one in 2000 years of worship there divulged what the ceremony consisted of. A short block and we entered the gatehouse to the ruined temple complex. An enormous sun-baked square opened in front of us, with Classic Greek and later Roman ruins tumbled about. The worship here was so important for so long that dozens of temples, stoas [= strip malls] and the like crowded within the walled enclosure. When worship stopped in the Christian era I’m sure much stone was carted off to use for other purposes. Thus it is difficult in to imagine the cult complex as it was in any of its hey-days. But there are clues. Huge stones with bas-relief carvings of torches, wheat sheaves and open poppies lie on the ground, which were once at roof level. 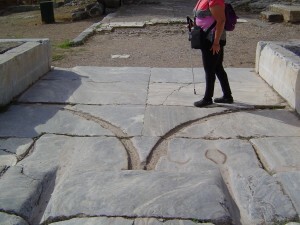 The huge grooves worn into the pavement show where the enormous bronze doors pivoted open. 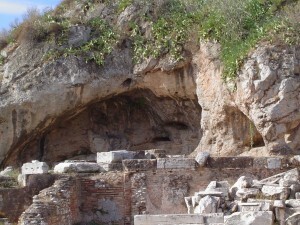 And in the side of the cliff face behind the complex is the cave from which Hades burst to abduct Persephone. I had brought to Greece a tiny silver pig that my friend had given me; having read that the traditional offering to Demeter was a pig. But having flown the silly thing halfway across the world I left it in the hotel room! Ron had a tiny copper coin in his pocket and we left that as homage to Hades, with the feeling that it was quite adequate since I had no hint of reverence anyway. And I do like my little silver pig. From there, we crossed the floor of the great temple and, behind it, the partially underground, cavernous room where the Mysteries were celebrated. Stone seats were carved into the cliff face and through the bedrock on the other 3 sides. Archaeologists are not quite sure how such an enormous space was roofed, if not with a forest of columns which would make viewing the ritual difficult. TMI Alert!! How I had to scramble to find a restroom aka WC. Thus relieved, I climbed all the way back to the top, leaning more heavily on my cane and very cross, so I didn’t enjoy the museum as much as I might have. 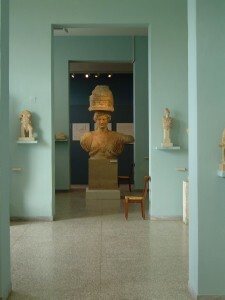 Inside is one of a pair of Caryatids, twice life-size, who once flanked the Temple entrance. The other one is in Britain at Cambridge since 1820. Hey, Ron, let’s go see that one! There were 2 dioramas of the site in its Greek and Roman days; too bad there was no guidebook, nor postcard of these. It would have made the site more understandable. Some charming young men were clipping rosemary hedges, creating a delightful scent, and I regained my composure as we shuffled our way back down the cliff stairs. We found the Sacred Spring, where the young women of the town danced to cheer up the grieving Demeter. 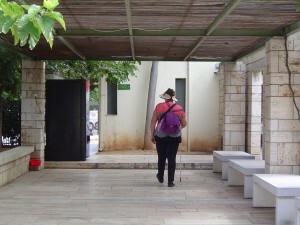 As we descended we began to formulate our theory about archaeology in modern Greece; that since there are so many important sites and the government is bankrupt, they literally cannot provide signage and guidebooks to the sites that are so rarely visited. That, and also Greeks cannot come to a consensus an anything. Thus uplifted and down-trodden in one morning, we waited an hour for our bus. But we were in the shade, on a bench and Ron bought us water from a vendor. Then, on to Piraeus!